The Oberhausen Manifesto was a declaration by a group of 26 young German filmmakers at the International Short Film Festival Oberhausen, North Rhine-Westphalia on 28 February 1962. 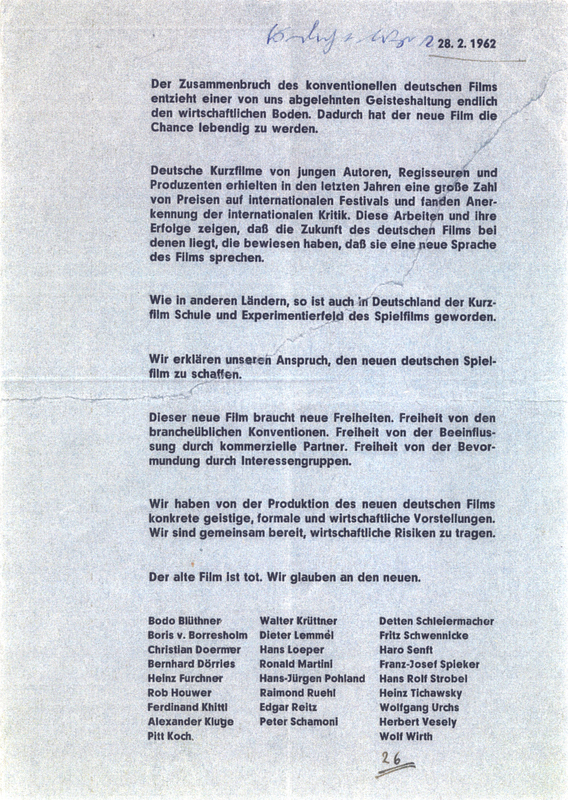 The manifesto was a call to arms to establish a "new German feature film". It was initiated by Haro Senft and among the signatories were the directors Alexander Kluge and Edgar Reitz. The manifesto was associated with the motto "Papas Kino ist tot" (Papa's cinema is dead), although this phrase does not appear in the manifesto itself. The signatories to the manifesto became known as the Oberhausen Group and are seen as important forerunners of the New German Cinema that began later in the decade. Their names are: Bodo Blüthner, Boris von Borresholm, Christian Doermer, Bernhard Dörries, Heinz Furchner, Rob Houwer Ferdinand Khittl Alexander Kluge Pitt Koch Walter Krüttner Dieter Lemmel Hans Loeper Ronald Martini Hansjürgen Pohland Raimund Ruehl Edgar Reitz Peter Schamoni Detten Schleiermacher Fritz Schwennicke Haro Senft Franz-Josef Spieker Hans Rolf Strobel Heinz Tichawsky Wolfgang Urchs Herbert Vesely Wolf Wirth. The Oberhausen Group were awarded the Deutscher Filmpreis in 1982. This page was last edited on 19 March 2019, at 21:50 (UTC).